So the first official snowfall of the season happened. It wasn't record-breaking by any means, but the accumulation was significant enough and the timing was just so that it really messed up the morning rush hour. When I woke up on Monday morning, that commute was all I could think about. I forgot how much I loved the first snow of the season as a kid. I would wake up and walk downstairs to find my dad sitting in his armchair, reading the paper, as he did (and still does) on the weekends. He would tell me to look outside. "It snowed!" I was so amazed by the beautiful blanket of white covering our yard, the woods behind our house, everything. On those mornings, all I could think about was that I couldn't wait to go build a snowman and go sledding. This photo was taken two winters ago but you get the idea. Now, most of the time, I see the snow as just another obstacle in my day, but every once in while, I'm able to appreciate the winter wonderland effect. Speaking of snow, do the colder, shorter days make anyone else feel like baking? No? Just me? To be honest, our apartment could use the extra heat from the oven. On Saturday night, I went to sleep wearing pajama pants, sweatpants, a long-sleeved t-shirt, sweatshirt and a robe. And I didn't remove a single layer of clothing. This Sunday I pulled out a recipe I should know by heart. Growing up my mom would always make banana bread, but not just any banana bread. My sister Kara and I would inhale the stuff--for breakfast, a snack, whenever. Maybe it's nostalgic for me, but I still whip out this recipe whenever the craving strikes. I even managed to make it for Michèle when I was living in Montpellier. This was not easy, but I was determined. The overripe bananas I had stashed in the freezer narrowly escaped the trash bin (my host mom thought I was crazy). I had to have my mom send me baking soda because I couldn't find it anywhere in France (I was able to find baking powder, or levure). Since chocolate chips weren't exactly a thing there either, I had to buy bars of chocolate and smash them up into little pieces. Then I had to weigh all the ingredients with an ancient kitchen scale. When I finally succeeded in producing a passable loaf of banana bread, Michèle proceeded to inform me that this was a cake, not a bread. "C'est un gâteau avec des bananes et des pépites de chocolat." So don't go trying to make sandwiches with this so-called bread! I know everyone always claims their banana bread recipe is the best, but I promise this one is actually amazing. My mom got the recipe from her friend, who got it years ago from a Norwegian coworker. I think what sets this recipe apart from others I've tried is that it calls for oil instead of butter, which ends up making it less dry. Also, as most banana bread connoisseurs will tell you, the ripeness of the bananas is key. There's no such thing as bananas that are too ripe, but bananas that aren't ripe enough will result in a bread that is less sweet. Nana's original recipe calls for nuts, but my mom would always leave those out. The recipe also calls for three bananas, but if you happen to have four, don't be afraid to use all four. The more banana-y, the better. As is the case with most baked goods, my favorite way to make this recipe is to add chocolate chips. My dad and sister still prefer the chip-free version, and my dad eats each slice with a thick slab of butter. To each his own I guess. 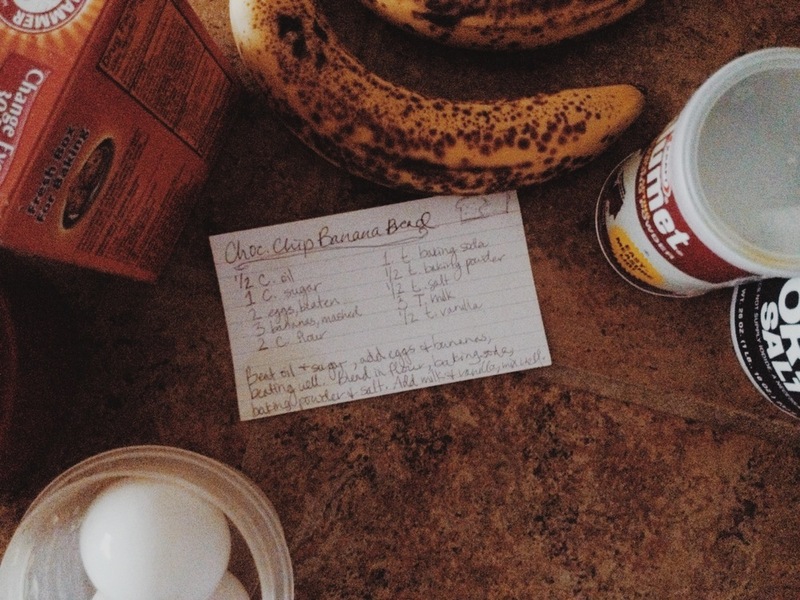 However you like your banana bread, I hope you enjoy this recipe. It's one of my favorites! Half the loaf was gone before I managed to snap a pic. That's how good it is! Beat oil and sugar in a large bowl. Add eggs and bananas, beating well. Mix dry ingredients in a separate bowl before blending into the other ingredients. Add milk and vanilla. Stir in chocolate chips. Pour into greased loaf pan. Bake at 350 degrees for about 60 minutes (add 10-15 minutes to the total bake time for extra chocolate chips).